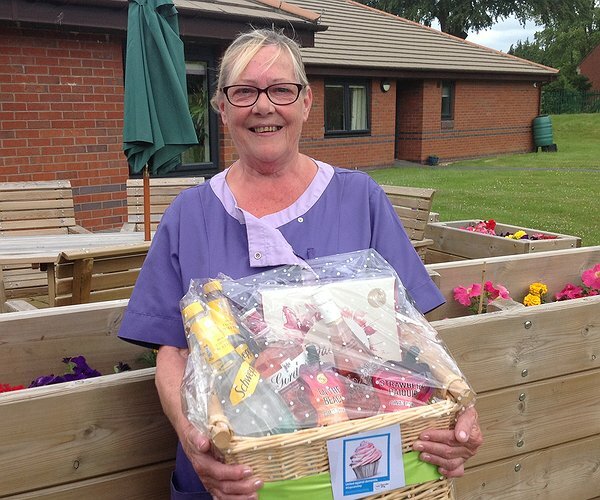 Julie Roberts, Housekeeper and raffle winner, is pictured with her prize in one of the garden areas at Chirk Court which was planted out by the residents recently. “It was lovely that so many family members and friends from the wider community came along to support the residents and staff here at Chirk Court,” said Mandi Southern, Activities Coordinator at the Clwyd Alyn Housing Association care home in Maes y Waen, Chirk. “All the cakes were hand-baked by our staff and by friends of Chirk Court. The raffle and coffee morning raised a brilliant £220 to support the vital work of this important charity while also allowing us to have a lovely get-together in the Orangery at the home. We’d like to thank everyone who supported us,” Mandi added.